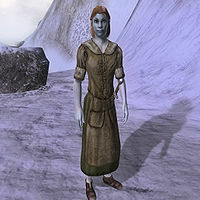 Norasa Adus is a Dunmer nightblade who is a devout worshipper the Daedric prince Hermaeus Mora, and can be found with her fellow worshippers at the Shrine of Hermaeus Mora. Norasa spends day and night worshipping at the shrine of Hermaeus Mora. She divides this worship into the activities of kneeling in front of three candles, preaching from behind the lectern, and relaxing by sitting on the bench. Norasa wears a set of lower class clothing: a collared shirt, green felt linens and a pair of rough leather shoes. She is armed with an iron dagger and carries a small amount of gold. Norasa knows a leveled set of nightblade spells, as well as one extra major Alteration spell. If you have not started Hermaeus Mora's quest she will say: "The fate of man drifts like seaweed in the net of His mind." and end the conversation. This page was last modified on 20 October 2015, at 05:37.